OpenChess is a Chess game, Opening Trainer and Chess data base for the PalmOS platform. OpenChess has a clear and easy-to-understand user interface. While playing you will see the board, coordinates, the last move in SAN notation and a couple of buttons to reach the most used functions with only one click. For example, you can turn the board, switch side, ask for move suggestion (hint) or display material differences at any time. OpenChess will support Drag and Move - you can make a move with just dragging a piece to the new square. A clock will display how much time the playing side has consumed so far. The same clock will be used to indicate the progress for computer moves. Additionally, you will be able to change background colors and piece sets. New piece sets can be either downloaded or you can even create your own one, provided you have bitmaps of your favorite pieces (OpenChess Pieceset HowTo). All games played against the computer or by yourself can be loaded and saved to the OpenChess palm database (PDB) and exported as PGN file to the Memo Pad application. Furthermore the board edit mode allows for setup of any legal board position, including information about castling and en passant possibilities. An opening book with 241 opening lines is built-in the OpenChess.prc - in addition, opening books can be loaded onto the device as palm database. In Player vs. Player mode you can record chess games including variants. In this mode you can go back and forward and recall all positions played. 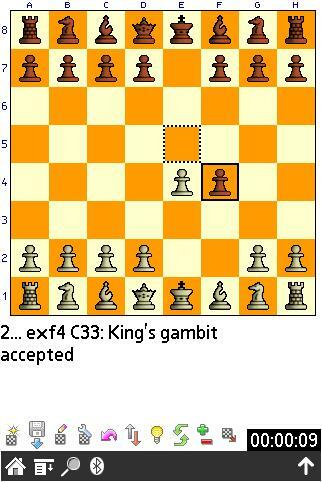 Additionally, it is possible to start a chess engine in order to evaluate the current position.